From one form to the other-Here is an Upcycle hack for you that can blow your mind. 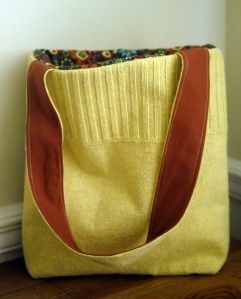 A sweater turns into a beautiful bag. Sarah from www.sarahdudik.wordpress.com shares this useful photo tutorial on her website.She has clearly explained, how she has used craft fuse with decor bond interfacing that are thicker than regular ones. When you are working on the sweater upcycle,there are few interesting tips by sarah to make it easier.Enjoy sarah’s colourful photo instructions of the sweater upcycle HERE.